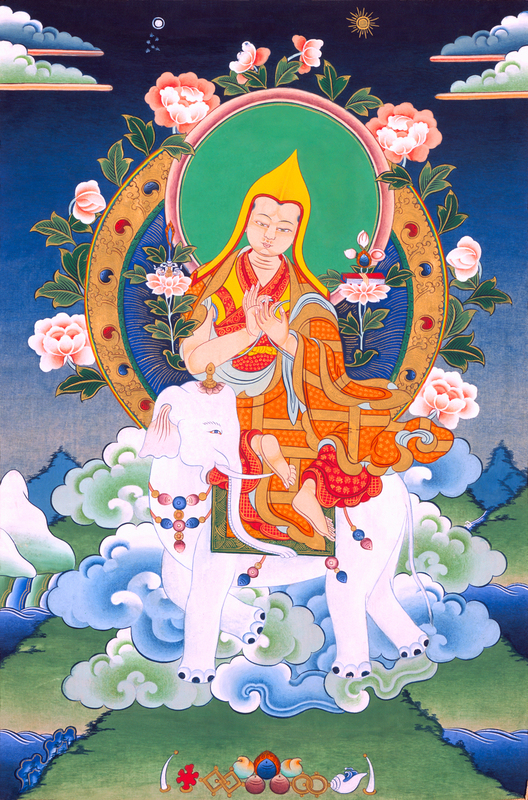 From this account by a blessed son of the lineage, the great Khachen Yeshe Gyaltsen, fortunate students can understand the inseparability of these instructions of the hearing lineage from the three essential yidams of the Gelug Tradition of Je Tsongkhapa, namely Yamantaka, Guhyasamaja and Heruka. Therefore, the complete practice of these three deities is not only crucial for the doctrine of Tsongkhapa in general, but also for the doctrine of the Gaden Hearing Lineage in particular. There can be no practice of the lineage without the explicit practice of these deities. Hence, in order to restore the intention of Tsongkhapa regarding the practice of tutelary deities, His Holiness the 14th Dalai Lama Tenzin Gyatso has tirelessly upheld their practice. He has given extensive advice regarding the preservation of all aspects of the teachings of Je Tsongkhapa’ three deities, and how their practice conjoined with guru yoga is the very essence of the path of the Ganden tradition. We see also that the 14th Dalai Lama’s advice regarding the protectors of the Gelug lineage is in perfect accordance with the instructions received by Je Tsongkhapa from Manjushri as written aboveby Yongdzin Yeshe Gyaltsen, and upheld by holders of the Hearing Lineage. Indeed, the words of the Dalai Lama regarding this issue echo the words Manjushri himself proclaimed to Tsongkhapa. Concerning the Gelugpa protectors, there are protectors of the people of the three scopes, Mahakala, Vaishravana and Kalarupa. In the center of the row is six armed Mahakala, the wrathful aspect of Avalokiteshvara, who protects practitioners of highest scope. Vaishravana is appropriate for those who observe pure morality, there is special reason for this, for although all protectors must be good for such people, Vaishravana is particularly pleased by purity. As those of middling scope are primarily concerned with ethical purity, Vaishravana is the appropriate protector for them. Those of lowest scope are primarily concerned with observing the law of cause and effect; and as Dharmaraja is the witness of wholesome and unwholesome actions he is their protector. ¹ Yondzin Yeshe Gyaltsen’s Commentary on the Guru Puja, translated into English by David Gonzales as “Manjushri’s Innermost Secret, A Profound Commentary of Oral Instructions on the Practice of Lama Chopa”. ² 14th Dalai Lama’s commentary on the Lama Chopa, translated into English by Geshe Thupten Jinpa and published under the title “The Union of Bliss and Emptiness”. So it seems all the Kadampa’s harumphing about the DL destroying the Ganden Whispered teachings is a distortion. DS only came into the picture well after the lineage was established. And what NKT presents is a very incomplete version anyway missing loads. I hope those poor NKT people realize what they are getting is very incomplete and connect with teachers with the full lineage rather than a new invention. You both are overlooking the recent discovery that the King Demon built the pyramids in Egypt! Oh, so now the NKT is making up New Age stories about DS building pyramids? LOL! This is getting so far away from Buddhism, it’s no wonder that the Dalai Lama says it’s no longer Buddhism! How odd that photo is. And how odd that NKT people are not more curious about what the actual Hearing Lineage is, but simply accept the company line without questioning and using other sources. 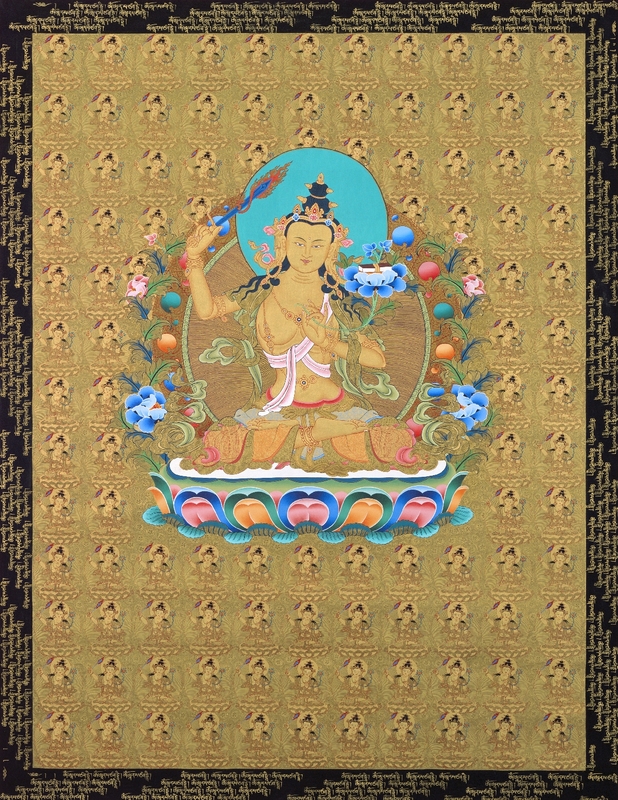 That painting is a new painting commissioned by Tsem Tulku. It is not a “discovery” from ancient Egyptian art. That last comment was directed @Matibhadra, in response to his Pinterest painting of Egyptians worshiping DS. It is a new picture, and it has nothing to do with authentic Egyptian art. Catlover, that is so disappointing– it would have been the most important archeological discovery since Heinrich Schliemann discovered Troy. Well, what about the atrocious severed hand image? I suppose you are going to tell me it is made of rubber and not the CTA. Complete Ganden lineage is not available via Khyenrab and Dekyong. Seek teachers with proper training and complete lineage. Will probably save money too lol. Fanatics can be found anywhere, even Dalai Lama fanatics. But that doesn’t mean it’s him or his government ordering those actions. However, sectarianism and clinging to the own tradition as inherently „pure“ + painting danger to „mix“ it with other traditions is a special tool to breed a powerful type of fanaticism and to sustain it. It cannot be ignored that this tool is much related to Shugden worship which is rooted in tribalism – a matter of belonging to something (special) and identity and therefore politics. I agree that the NKT does use sectarianism quite a bit. That wasn’t my point, however. My point was that just because there are fanatics who do crazy things while shouting the Dalai Lama’s name, that doesn’t mean the Dalai Lama endorsed or approved of it, or would ask them to do those things. It seems as though the NKT assumes that every action done by a so-called Dalai Lama follower is something he ordered them to do, and a lot of NKT people don’t seem to have any concept of an individual person doing those things on their own, lol! Thank you. Sorry, Catlover, I misunderstood you. I totally agree with what you say in this comment. Taking an empowerment from Steve Booth…..ewwwwww…..
One hundred years is the long term target for the 84000 initiative to provide “universal access to the Buddhist literary heritage” that is, to translate the Kangyur and Tengyur into modern languages. Although he has been teaching as ‘a Tibetan monk’ for many years, Kelsang Khyenrab (Steve Booth) is still struggling to translate one word denoting ‘ban’. Perhaps this 100 year schedule would suit his ability. NKT centres display the Kangyur and Tengyur, apparently no one ever opens the books. “If you go too far analyzing whether a vase and a pillar are samsara or not, you might waste your precious human life in vain with dry words. If you rely upon all sort of facsimiles of logical debate, you might fall over the cliff of eternalism and nihilism like a confused blind man. If you hover too much your empty hand and mouth amidst those who are beautified by saffron robes, you might contaminate the elixir of Dharma with your impure pus and blood. If you are too distracted to practice properly, though you know the Tathagata’s teaching, you might become like a monkey-dancer in a foreign country. Thus, regarding the subject, sound; it is impermanent because of being composite, like a vase. Consequence is conditioned by occasion. Kelsang Gyatso has no Geshe degree it has been removed because of he is a liar and disgrace to his teachers. 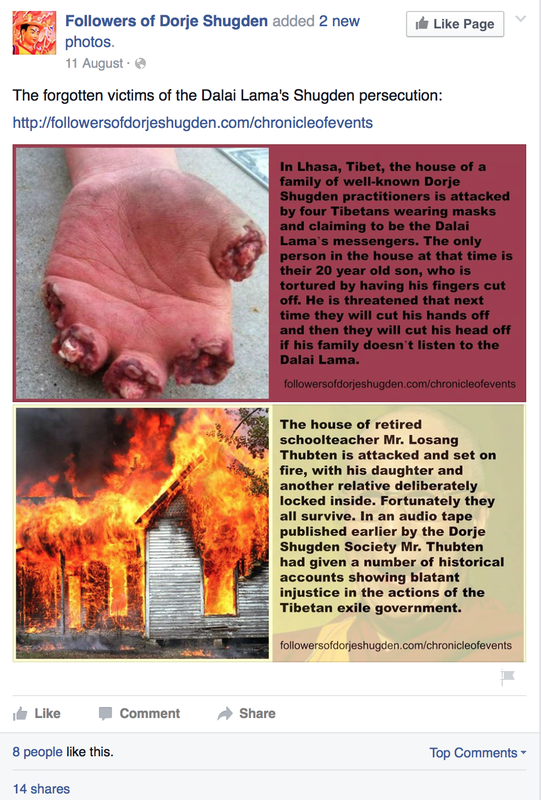 Attacking both the Tibetian Government and Tibetians who are fighting for a Free Tibet. The treasonest act of a liar. He and the NKT have been found out so many times now.